Are you tired of trying to live for Christ-only to fail time and time again with the same old behaviors? Do you pray for guidance, ask for deliverance, and vow to do better, yet fail to progress? As an author, speaker, pastor, and blogger at Ragamuffin Soul, Carlos has lived much of his spiritual life in the spotlight. But, like any Christian, his faith story has its ups and downs. He spent decades trying to figure out how to be a "better person." Time and time again, he strived for holiness only to get caught in the web of destructive habits, behaviors, and thought patterns. But, the buck stops here. Or, rather, the spider is killed here. 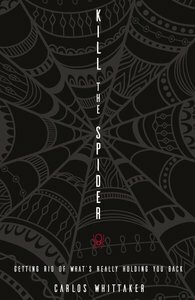 In Kill the Spider, Carlos shares personal material ranging from hilarious, self-deprecating stories to passion-filled wisdom-to show others it's not enough to try and "stop sinning." He teaches that knocking out deep-rooted habits and issues comes by treating the issue, not just the symptoms. With transparency, humor, and vulnerable stories, Carlos offers a breath of fresh air to any believer looking to finally step into the freedom in Christ. So, sit down. Open the book. And grab a shoe. We're going on a spider hunt.